NCH Sound Tone Generator is a lightweight program which enables you to easily create noise waveforms, sweeps or audio tones on your Mac computer. The program can be used for a wide variety of tasks, such as tuning music instruments, testing and calibration of audio equipment, audio levels alignment, demonstration of audio principles, and many more. NCH Sound Tone Generator is able to support a wide range of frequencies, starting from 1Hz to 22kHz bandwidth. The program lets you create up to 16 tones at the same time. 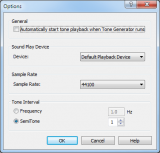 The created tones can be saved on your hard drive as WAV audio files. Allows you to create multiple tones simultaneously. Supports both mono or stereo operation. Tone Generator has been tested by Download82.com team against viruses, spyware, adware, trojan, backdoors and was found to be 100% clean. Our editors will recheck this software periodically to assure that it remains clean.